Inspired by the look of a well-loved journal or artist's sketchbook, these pouches are crafted in-house an locally to keep your fine art velvet prints safe. They come in two options; cream linen tied with ribbon, or soft leather tied with suede. Our leather is sustainably sourced deadstock from various brands, so the colours are often unique and subject to change. The linen pouch is complimentary with all packages, but the leather option is reserved as an option for theClassic Bundle sessions. 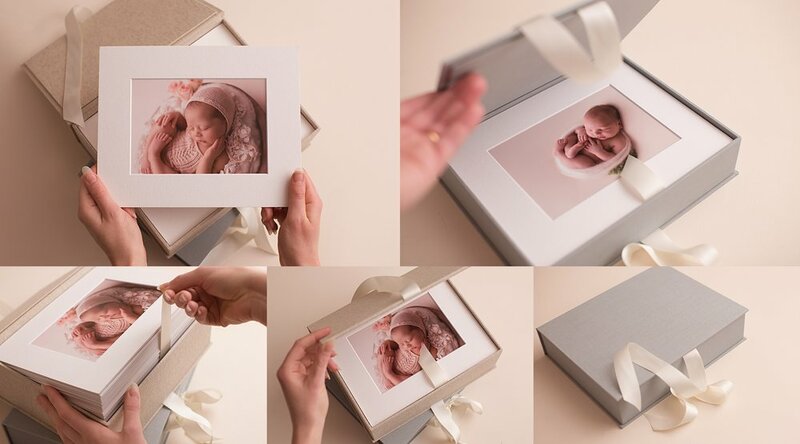 Beautiful handcrafted portfolio keepsake box, designed to keep your matted prints safe for many years to come. Made by New Zealand's leading artisan bookbinding specialist. Tied with a satin ribbon and available in cream or duck egg blue, this 'unbound album' is perfect displaying on your coffee table or tucking away on your bookshelf.